One thing that the Japanese confectioners do really well is their gummi candy. The many flavors, the soft chewy texture and the colorful packaging just lends to a wonderful candy eating experience. This is why I was so excited to find these charming Meiji Apricot gummis in a box of samples kindly sent to me from Jbox.com. 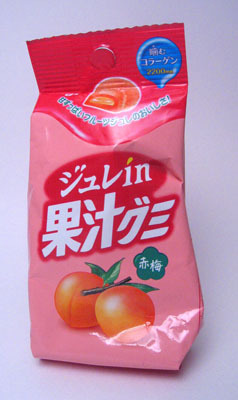 Apricot is one of my favorite fruits, so seeing it in a Japanese candy form made me even more worked up! The colorful package with the apricots on the cover is just too precious. Some designer did a fantastic job with this one. The icon in top corner claims it has 2200mg of collagen in them, which is some new beauty Japanese health craze that Meiji is obviously trying to cash in on. According to the large illustration of the package, the gummi has a liquid center. I’m interested by this since it’s something I’ve never experiencesd before. Have the Japanese found a way to make their gummis even more irresistible?